December 1, 2011 TAIF-NK PSC- once again the winner of the competition "100 best goods of Russia"
On November 29, a formal function to award winners of the Republican competition “Best goods of Tatarstan Republic” and All-Russian competition “100 best goods of Russia” was held in a National Cultural Centre “Kazan”. In the history of the competition for the first time the Tatarstan Republic was awarded a diploma of higher degree - Platinum diploma. In November 2011, passed compliance audit the Company's integrated management system for compliance with requirements with international aviation standards of the new version of the EN/AS 9100:2009 (rev. C). Meeting the requirements of this standard is mandatory in the production of jet fuel, and for government and military orders. You can get the full amount of the necessary information on the manufacture and supply of oil products and to discuss prospects of cooperation with our company, to communicate with experts. October 24 - 27 – Head of Proactive Sales Department Mrs. Tatyana M. Vereschak. Decision of the Federal Service for Financial Markets of the Russian Federation dated 11 October 2011 registered prospectus of ordinary registered uncertificated shares of TAIF-NK PSC in the amount of 5,851,000,000 (five billion eight hundred and fifty-one million) shares with a par value of one (1) each, State registration number of issue - 1-01-50545-K, date of state registration - 06 December 1999, as well as the ordinary registered uncertificated shares in the amount of 77,000 (seventy seven thousand) shares with a par value of one (1) each, State registration number of issue - 1-01-50545-K-003D, date of state registration - March 31, 2011. AK&M – a leading independent national rating agency in Russia – assigned an “A” national scale credit rating to TAIF-NK PSC with stable outlook. “A” rating means that TAIF-NK PSC belongs to a highly reliable class of borrowers. The revenue of TAIF-NK PSC for the first half-year 2011 amounted to RUB 65 bln., net profit – RUB 7.5 bln, and EBITDA – RUB 10.6 bln. Press release has assigned TAIF-NK PSC posted the official website of Rating Agency AK&M http://www.akmrating.ru/taif.stm. September 26, 2011 The Company TAIF-NK is the winner of the contest of "Russian organization of high social efficiency"
On September 26, 2011 a rewarding ceremony for the winners and awardees of the republican stage of All-Russian contest "Russian organization of high social efficiency" has been held in Kazan. According to the results of the competition the company TAIF-NK has become the winner in the nomination "For development of labor market institutions in the production sector ". 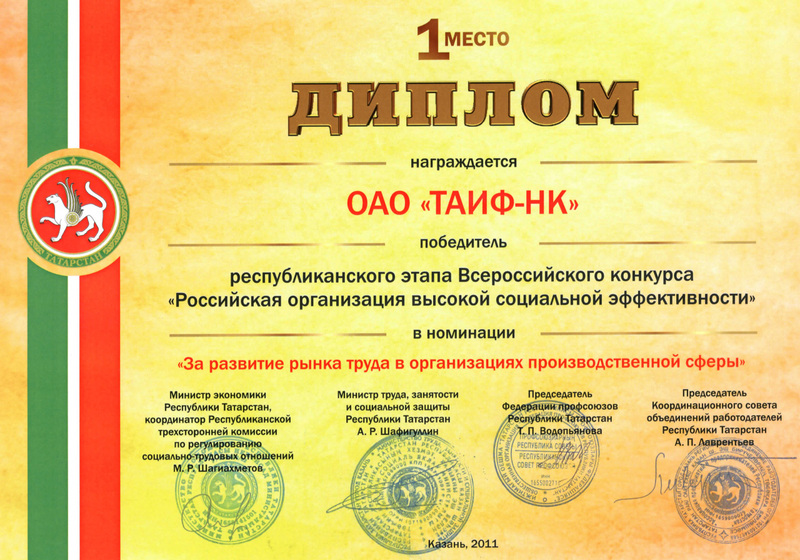 TAIF-NK Company was awarded by The Federal service of ecological, technological and nuclear control (Rostehnadzor) with Certificate of honour “For the best organization of work on introduction of new technologies, modernization of manufacture, improvement of reliability and security of enterprises’ industrial objects”. September 12, 2011 TAIF-NK participated in the XVIII International Exhibition "Oil and Gas. Petrochemistry "
The company TAIF-NK PSC participated in the XVIII International Exhibition "Oil and Gas. Petrochemistry" which took place from 7 to 9 September 2011 in Kazan. This exhibition is the most important annual event of the industry and traditionally its participants are the leading enterprises of Russia and the world leaders in the extraction, transportation and processing of oil and gas. July 12, 2011 TAIF-NK is a winner of a “Best goods of Tatarstan Republic” 2011 competition. In June 2011, the Ministry of Industry and Trade of Tatarstan Republic summarized the results of a republican competition “Best goods of Tatarstan Republic” for 2011. TAIF-NK became a winner in the nomination “For Efficient Environmental Management” among the enterprises of a Republican level in the annual competition “ECOleader”, organized by the Ministry of Natural Resources of Tatarstan Republic, based on the results of 2010.